In order to set up several web projects with independent file structures on XAMPP for Linux, we'll need to add some lines to our Apache configuration and get our custom domain registered with our HOSTS file. Even if that sounds a little involved, you'll see in the video that it's a pretty quick process. What we're going to do next is set up a unique folder and domain name for a web application built on XAMPP to demonstrate what we would need to do if we wanted to run several independent sites or Drupal installations on this one stack. We saw already that we could put files inside of our HT docs folder, but eventually that's going to get crowded as the number of projects that we have expand, and we've also seen how we can spin up a Drupal site with Bitnami but we can only have one Drupal site at a time. So the first thing we need to do is modify the Apache configuration to allow virtual hosts. And that's actually a lot simpler than it sounds. We're going to open up the file explorer and we're going to go back to the lamp base folder here. And we'll open up ETC and then HTTPD dot conf. This is the Apache configuration. We're going to do a search in this file for V hosts and we have a line here for virtual hosts. And we're going to uncomment that out by removing the hash symbol. Again if you have problems with this it may be that you didn't open the file up as a super user, and so what this says is that we're going to include this file. This configuration could exist in HTTPD conf but it's simpler to separate it out to a separate file. So let's open up this file and modify that. So we're going to open up extra and then HTTPD dash V host dot conf. This entire content just contains examples, so we're going to remove that all, and the first thing we want to do is create a fall back just in case we access a virtual host whose folder doesn't exist. This is what that's going to look like. There's an opening virtual host tag and it's everything at port 80. And then a closing virtual host tag, and inside of that we're setting the document root to the web root that comes bundled with XAMPP and we're setting the server name to local host. So if we save this we're all set up to begin adding additional websites. So at this point adding a new site requires a four-step process. First we create the folder where our website is going to exist, next we add that folder as a virtual host here. Third, we add the domain name to something called a hosts file, and then finally we restart Apache. Let's go through that process. So first we create a folder. 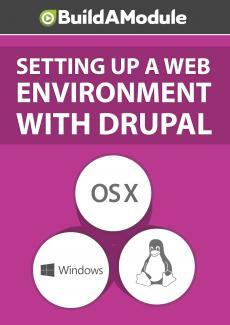 When we installed Drupal via XAMPP it installed it in our apps folder.